The catch car actually runs inside that channel, with a little 'pin' that pokes through the slot connecting the train and catch car. I struggled to find an image online (although admittedly didn't try very hard), but hopefully that makes sense? DelPiero and Hixee like this. But how does compressed.air work to propel the ride? Does the channel get highly pressurised on one side? 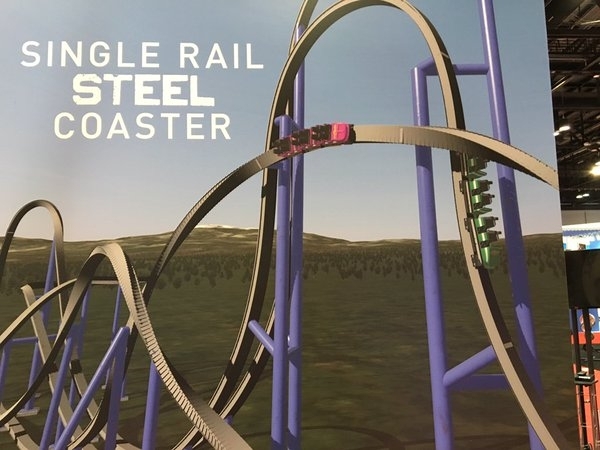 I believe not, I think they actually have a cylinder running underneath the track (or in some enclosure somewhere) with the piston in, and the cable then connects that cylinder to the catch car in the trough. Similar to how their towers have the cylinders inside the tower, and use a cable looped over some pulleys to move the carriage. EpochEmu and CrashCoaster like this. Isnt the system pretty similar to a Hydaulic launch coaster just the compressed air is used to drive the motors rather than hydraulic fluid? Those motors power a winch drum which is connected to the sled inside the track pulling the car forwards? Thats how I always imagined it anyway. Think of this but with air not fluid. Yeah, I think so. It's just that the air cylinders are much bigger. 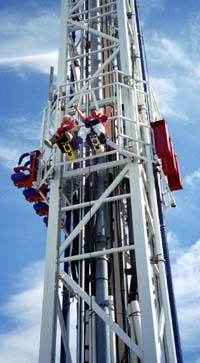 I have to admit, I'd always assumed they just wired directly into the cylinders (for both the coasters and the towers), but now I think about it that just sounds like a nightmare of sealing. I think you're absolutely right. Coaster Hipster, Hutch and Zek_Teh_Kek like this. Snoo and b&mfanboy123 like this. Matt N and GuyWithAStick like this. Video by Amusement Insiders (volume 0 is the recommended volume level for viewing). Stevie, Peet, b&mfanboy123 and 2 others like this. So I assume the people filming this are going there to attend holiday in the park? Official Maxx Force animated onride POV! Pear, Pokemaniac, b&mfanboy123 and 2 others like this. That looks awesome; short but sweet! Hmmm. That doesn't look as impressive as I initially thought during the reveal. It feels lacking. I sound like a hypocrite because I love Dragster/Storm Runner/Stealth but those are meant to be one trick ponies and they perform it very well (well Storm Runner's a bit longer but still a short ride). Yeah I don't know. My first impressions were "best looking ride of 2019" but no way I'm thinking that now. Who knows, it could end up being a great ride. I like the headchopper at the beginning though. tomahawk and CanobieFan like this. Two trains with 16 riders, not 12? Pokemaniac, b&mfanboy123 and Matt N like this. I, personally, think this looks really ? The launch will be fun and that quick inversion might be good fun, but the rest of it just seems a bit ? I also hate the final inversion into the brakes, I think a continuous roll into the dive loop downwards would've worked much better for the flow as opposed to it changing the roll direction halfway through - it feels like they were trying too hard to make this unique? tomahawk, Edward M, CanobieFan and 1 other person like this. The launch looks fun but I can't help but wonder if the mini airtime hill thing will make it feel quite jerky. The whole layout looks too try-hard weird to me. The claim of it being North America's fastest launch coaster irrationally bugs me too. Like I know what it's trying to say, but it's not saying it right. Lofty, MakoMania, Snoo and 2 others like this. Saying it best right here. I do love TTD almost to a fault so I think I may like it more then most but it definitely won't be a world beater. Should be "North America's fastest accelerating coaster". I also hate the final inversion into the brakes, I think a continuous roll into the dive loop downwards would've worked much better for the flow as opposed to it changing the roll direction halfway through - it feels like they were trying too hard to make this unique? I think it'll be a sweet ride but a bit too short. The first element looks to be pretty fun and I like the barrel roll sequence to end the ride...it just ends too abruptly. And hey! It went vertical! Maybe it actually WILL open before July! tomahawk, Youngster Joey and b&mfanboy123 like this.